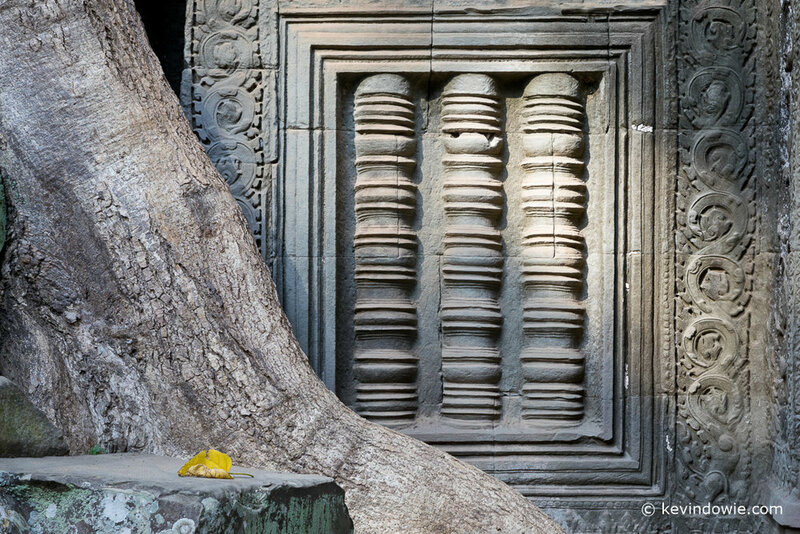 A recent trip (only just completed) to Cambodia, to visit the World Heritage listed historic sites around Siem Reap, provided ample opportunities for carefully considered photographs. I found myself photographing almost exclusively with the camera mounted on the tripod, a really useful way of working with such subject matter. The act of setting up the tripod and levelling the camera, forces you to slow down and study the scene. The subject in front of the camera has been there for hundreds of years, so there’s no excuse for rushing about like a headless chook. Time spent checking the edges of the frame through the viewfinder (a good practice in any case) is time well spent. Time spent appreciating the subtle changes in light and shadow as they fall across the subject is also time well spent. I learnt that the camera can pick up such changes more effectively than the human eye sometimes can. This process of slowing down and concentrating on the subject and the light intently means that you not only look, but you see! It’s not hard to think of this style of photography as contemplative, or even meditative. I also found that the location lends itself beautifully to black and white images and as I progress through the processing of my files, I suspect a large proportion will be monochrome. Having said that, today’s image is obviously about colour.